Oxford University has for the first time published a league table showing the performance of its colleges. For many years some newspapers had compiled the "Norrington Table" from undergraduate degree results posted outside the Examination Schools. The university did not endorse these versions but says it is now publishing official results "in the interests of openness." Despite the move, it said such college listings were "not very significant". 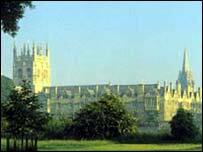 This year Merton College, founded in 1264 and one of the university's oldest colleges, tops the table. Bottom of the table is Harris Manchester, which admits only mature students and attained full college status in 1996, making it the university's newest college. The tables show how many undergraduate degrees were gained in total at each college and permanent private hall, together with a break-down of degree classification. They also give a "Norrington Score" by applying a formula which expresses overall attainment in final examinations, expressed as a percentage. The university has 30 undergraduate colleges and seven small private halls, which were set up by Christian denominations and retain a religious character. The university says the results of the private halls are published separately because they are so small that comparison with the colleges would be meaningless. Dame Fiona Caldicott, Chairman of the Conference of Colleges, said the university had decided to publish the official data so that the public had the complete picture. Versions of the Norrington Table which have previously appeared in newspapers were inaccurate, she said, since some students used the Data Protection Act to ensure their degree result was not made public. "As this gives an inaccurate picture, and it is clear that there is an appetite for the information, we have decided to publish the results in full," she said. "Ranking colleges on the basis of degree results is not very significant," she added, "as the numbers involved per college are small, and the results are dependent on the performance of a particular group of students in a particular year, rather than on the college itself. "However, in order to be open and transparent, we are publishing these tables so that the public has access to the full, accurate data. The Norrington Table was first published in 1964. It was proposed by Sir Arthur Norrington, a former president of Trinity College and Vice-Chancellor of Oxford University from 1960 - 1962. A similar league table showing the academic results of colleges at the University of Cambridge has been produced by the Independent newspaper since 1981. The Tompkins table, which is an unofficial league table and not recognised by the university, was invented by mathematician Peter Tompkins. This year St Catharine's College topped the table for the first time.